The 18th century was a wealth of knowledge, exploration and rapidly growing technology and expanding record-keeping made possible by advances in the printing press. In its determination to preserve the century of revolution, Gale initiated a revolution of its own: digitization of epic proportions to preserve these invaluable works in the largest archive of its kind. Now for the first time these high-quality digital copies of original 18th century manuscripts are available in print, making them highly accessible to libraries, undergraduate students, and independent scholars.Rich in titles on English life and social history, this collection spans the world as it was known to eighteenth-century historians and explorers. 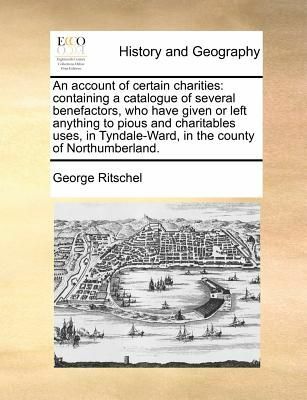 Titles include a wealth of travel accounts and diaries, histories of nations from throughout the world, and maps and charts of a world that was still being discovered. Students of the War of American Independence will find fascinating accounts from the British side of conflict. ++++The below data was compiled from various identification fields in the bibliographic record of this title. This data is provided as an additional tool in helping to insure edition identification: ++++<sourceLibrary>British Library<ESTCID>T118995<Notes>Anonymous. By George Ritschel, the Younger. Text is continuous.<imprintFull>Newcastle upon Tyne: printed by John White, (for the author, ) and sold by him at his house, 1713. <collation> 6],30,! 2],31-58,51-69,! 1]p.; 8.